I came up with a small Python script which filters & processes the data from all matches on Xonstats, and uses ROOT to generate two plots for each gametype: The first one shows the number of games played per server and per map (one axis each for server and map; the color shows the number of games). The second one shows the relative difference of the number of games won between red and blue. 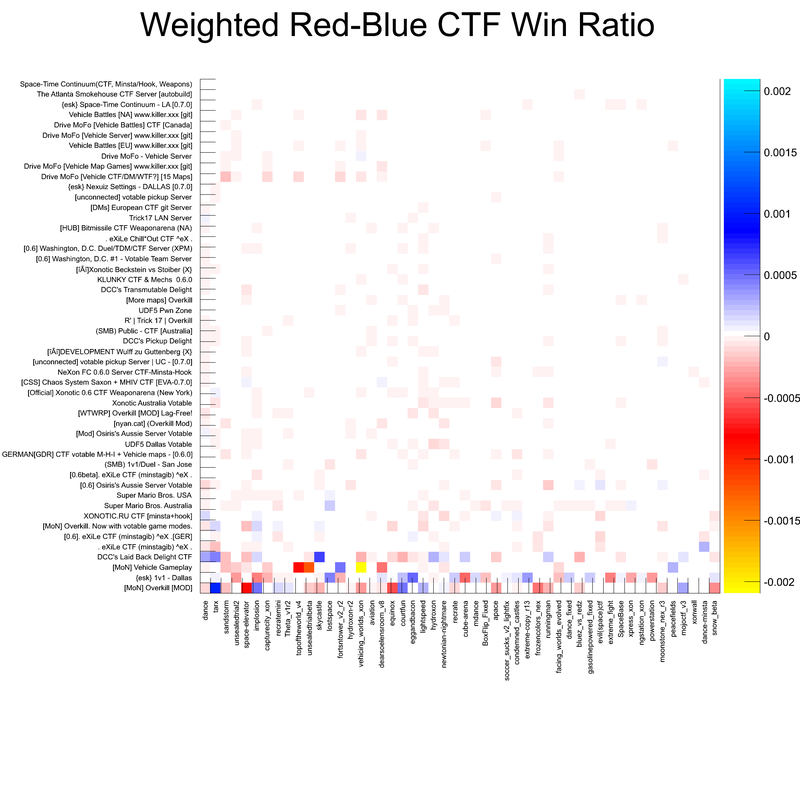 It is defined simply as ratio = (wins_red - wins_blue ) / total_games. Therefore, -1 means all games were won by red, and +1 means all were won by blue. This is also represented by the color in the according plot. Note that I filtered out most of the Insta+Hook servers, mainly because the hook may even out map asymmetries and the like. Normal Insta and Overkill is still included. For example, one can see that on some (probably public) servers, red wins a majority of games. Smilecythe already suggested that the reason could be people joining the red team by default. On the pickup servers, that idea should not apply though. One of my personal ideas to explain these red-blue asymmetry is – apart from obvious asymmetries in the maps (which we don't have except for maybe a small number of maps) – a chirality effect ("handed-ness"), meaning that it could make a difference if you have make a left or right turn when you attack. UPDATE: Added plot where win ratio is weighted by number of games (it turned out that most of the extreme values in the win ratio plot are caused by a really small number of games played). UPDATE 2: Fixed kinda misleading colorscheme for the values. 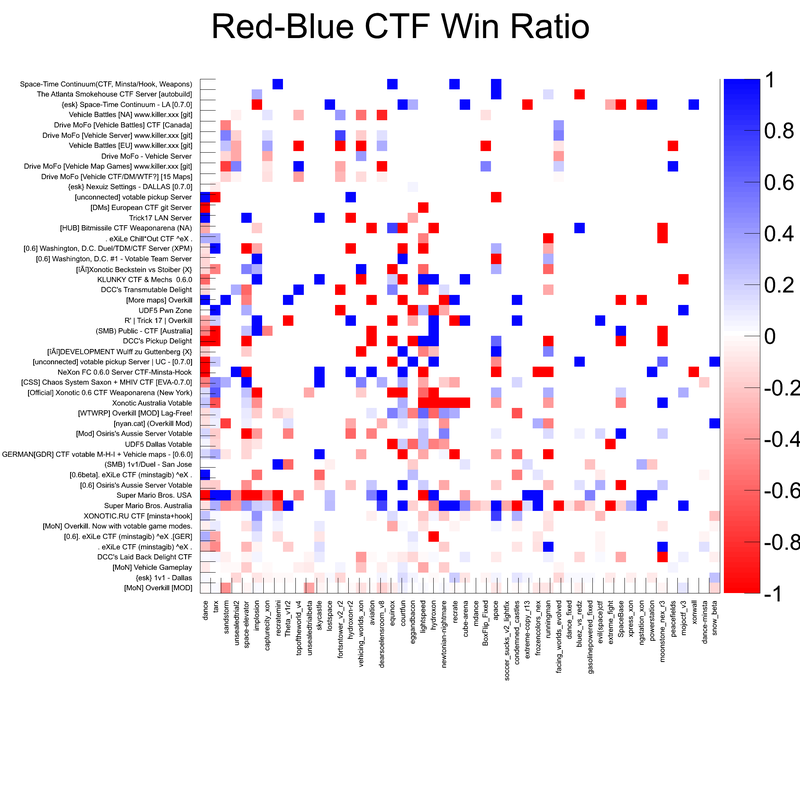 Using an even number of colors shifted the perceived mean value towards red, giving the wrong impression in the plots. print "Win Ratio by Map:"
print "Win Ratio by Server:"
Very interesting indeed, thanls for sharing. I hope KH stats don't include games with yellow and pink teams! To me it's just a random fact, cause there are so many things that influence it (for public at least) like skill gaps, teamsize etc. Also for sure the color won't change the outcome of a TDM game if a red team wins by ~20 frags and the match gets replayed with swaped colors afterwards. 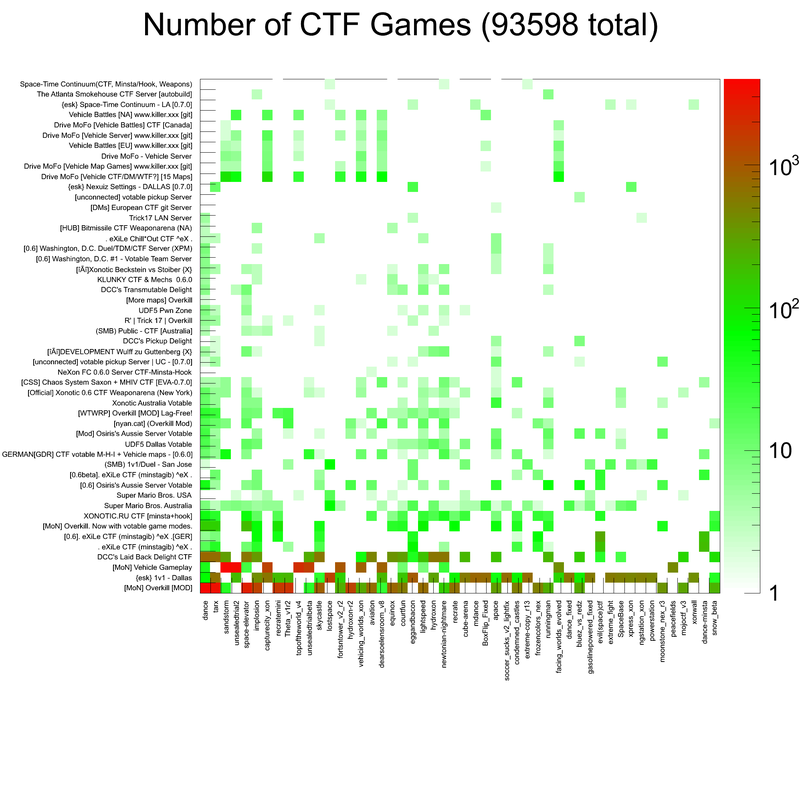 If I am bored enough soon, I will go through my 5v5 CTF pickups, which are almost 200 games. It's probably just a placebo, like I prefer to be in blue team and shooting reds. I only force a green color in DM modes. (02-11-2014, 06:20 PM)Mirio Wrote: To me it's just a random fact, cause there are so many things that influence it (for public at least) like skill gaps, teamsize etc. (02-11-2014, 06:20 PM)Mirio Wrote: It's probably just a placebo, like I prefer to be in blue team and shooting reds. I only force a green color in DM modes. So, you're affected by this psychological red-blue effect then? I also like my blue teammates! You probably need very even teams and let them play like 10 matches on the same map against each other. 5 as red, 5 as blue. This is why this red/blue comparison needs many, many games under same conditions and different maps. For example cloud9 is just too good on Dreadful Place. (02-12-2014, 04:52 AM)Mirio Wrote: You probably need very even teams and let them play like 10 matches on the same map against each other. 5 as red, 5 as blue. Also, wtf is cloud9?! And why do you choose a silly name like that. It is especially silly compared to a totally sane name like OHSNAP! I confirm trying to get into blue team, feels better to shoot on red (evil guys). And I do force player model colors to green. Well everyone knows that red is faster. But i think you can always make the statictics to your liking and its more a placebo than anyting else.